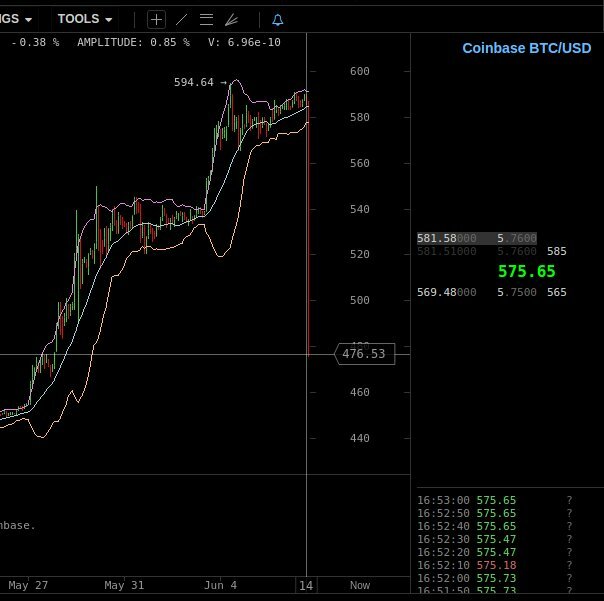 The reported price at fiat/Bitcoin interface Coinbase almost exactly one hundred United States dollars per Bitcoin after a single sell of 265 Bitcoins demolished their orderbook. The Coinbase "exchange" like the Winkelvii (WOT:nonpeople, possibly arbuscular mycorrhizal organisms) operated Gemini exchange manifests a hypothesis made famous by the late American philosopher Yogi Berra that a venue can be so popular no one patronizes it. Coinbase exchange and anything the Winkelvii touch generate substantial lamestream attention creating an appearance of popularity, but incidents where people actually try to use these platforms to trade seriously reveal that there actually isn't anyone using the places to conduct their business. The real question is why someone decided to sell at such a loss. Oftentimes plain stupidity is enough explanation. We see it on BTC-e, we saw it on MPEx (there's a trilema somewhere covering the event, which I'd think was for much larger sum than 265 BTC). And where you don't see it, it's because there are some retarded "protection mechanisms" in place. Mostly to protect the scam, but sold of course as 'consumer protection' and For Your Own Good(TM). So, most likely nobody decided, it just happened to them, like everything 'happens' to the stupid. Although I've heard a few folks who claim to know say they do this to prevent their own actions to cause a trend which amplifies the fluctuation beyond the point where slippage would have taken them (like people following the trend and eating even deeper into the orderbook). Doesn't make much sense, especially in cases like this. My own 'solution', which might not be useful everywhere but was useful enough for me was: never ever place a real market order, assuming sane exchange that will allow it no matter what. Always place limit order at the worst price you are willing to take. Sounds obvious and not even worth writing, but reality always proves this kind of assumptions wrong. And if you want protection mechanism for typing wrong, have it on your side.